I think a lot of people would be able to relate to this problem mainly through personal relationships, however it could also be for many the situation of anything like family, friends, work etc. Sadly, it’s just one of those moments in life where you are just forced to either take it or leave it. Or as my parents say, “like it or lump it”. Perhaps it is a lesson for us to become stronger people. I don’t deal with this situation very well, I always stress about all of the “what if’s…” , but I guess all I end up doing usually is hanging on that little bit longer to see what happens next. You’re bound to know when you get to that point where you just think “that’s it, I can’t take it anymore… I give up”. And when you do, in time you will look back on that and see it as a lesson (whatever that may be). Reblogged this on Crazy Cool. This post was beautifully written.. The moment I decide it’s time to walk away from something is when I can look at it and know looking back I wouldn’t regret where I ended. I would be happy with how far I got and tried. You are so right about them being lessons learned. This post is so great! You speak the truth and I know just how hard that decision is! 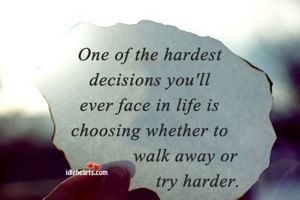 I’ve had to choose numerous times actually, some I regretted, others I was happy with my decision! And yes! I did see things as a lesson! I’ve nominated you for the Liebster Award on my blog. Hope you can take part! So cute. So true. Well said!